Add a Feedback block to your points email template to start measuring customer satisfaction. With Feedback, you'll be able to measure customer satisfaction automatically, and find out what your customers think about your store to identify areas of improvement. 📝 Note: You can customize the look and text of your feedback block in your Feedback Settings. 5. Click into your email template, under the call-to-action button paste the Feedback Block merge tag. 📝 Note: Feedback will only work if Earned Points Email is turned on. 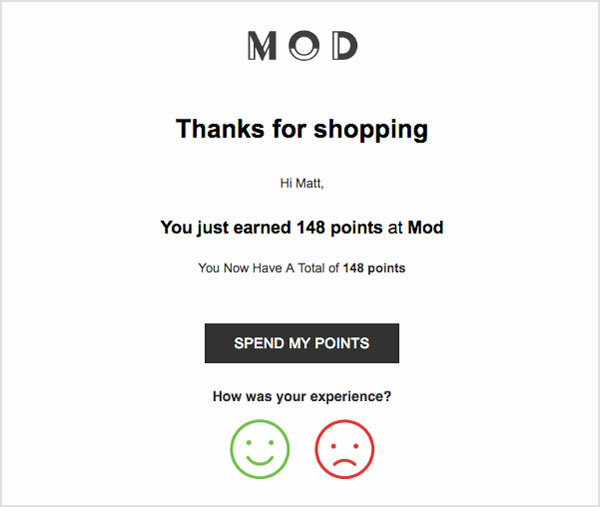 When the customer makes a purchase, they will automatically receive the earned points email and ask them to give feedback on their shopping experience. The customer will then click on either a happy or sad face to indicate their satisfaction with their most recent purchase. This will send them to a short feedback form where they can provide more detail. Here your customer can provide more details to their feedback and can leave a comment, outlining what affected their most recent experience with you. If your customer does not fill in this form, but has already clicked the happy or sad face, their original response will still be recorded automatically and their reason will be 'Unspecified'. Once their feedback is submitted a thank you message confirms their response has been recorded. All feedback will be recorded in your feedback admin and is for your eyes only.